After last week agreeing with Michael Pollan that junk food is OK as long as you make it yourself, it seems like the perfect time to share my new favourite technique for cooking burgers. Normally if I were on a burger-flipping spree, I’d fire up my barbeque to get a nice crusty patty. But recently I’ve been spending a lot of time at my Irishman’s new residence in the Snowy Mountains which is between barbeques at the moment (not that I’m complaining, the kitchen is new and a dream to cook in – electric oven with a gas cooktop, say no more.). So when I read about a technique for cooking burgers in a frying pan that give juicy burgers with a lovely meaty crust, I was very keen to give it a go. I picked the idea up from Robert Wolke in his great food-nerd, I mean kitchen science, book ‘What Einstein Told His Cook’. The theory goes, that if you cook your burgers on a thin layer of salt, the salt initially draws out juices from the meat. It then quickly congeals the juices to form a crust that prevents further moisture loss. It also prevents the burgers from sticking to the pan and encourages all the delicious brown crunchy bits to stay attached to the burger rather than the pan. On my first attempt I was working from memory on quantities and actually used more than twice the amount of salt I should have. While these maiden burgers delivered in terms of their crust and juiciness, they were unbearably salty. Which didn’t stop us from devouring them but did result in copious water guzzling afterward. Consulting the recipe for the correct quantity a few weeks later, the burger experiment was repeated with brilliant results. Even in my most un-nonstick pan, they cooked without so much as hinting they were going to attach themselves to the pan. And the flavour was everything a good burger should be: beefy with crispy caramelised bits and perfectly seasoned. Too easy really. Inspired by Robert L Wolke from What Einstein Told His Cook. I know what constitutes the perfect burger is really a personal thing. So please feel free to take this recipe and customise it. I’ve played around with using tomato sauce (ketchup) as well as mayo and even mixing the two together to make a crazy pink hybrid sauce. But the mayo on its own was a hands down winner. I normally consider onions a burger essential, but to keep this under 10 minutes, I’ve added chopped chives to the burger meat to give a little oniony flavour burst without the time required to cook down onions. Place 1 scant teaspoon fine sea salt in a skillet or heavy based frying pan and shake to cover the base. Heat over a medium high heat for 3 minutes or until very hot. Meanwhile, combine beef and chives and season well with black pepper only. Form into 2 burger patties. Cook burgers for approx 3 minutes. Lift the burgers out of the pan, shake the pan to redistribute the salt to where the burgers were. Return burgers uncooked side down and sear for another 3 minutes or until cooked to your liking. 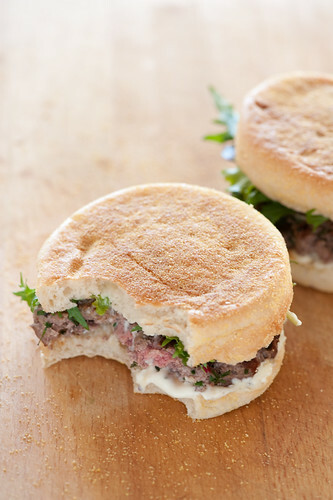 Spread mayo on the insides of your muffins or bun. Place beef on the bottom half. Top with leaves and finally the top of the muffin / bun. Enjoyed this? Why not subscribe to stonesoup by email or RSS to receive your free updates published twice a week. Interesting. 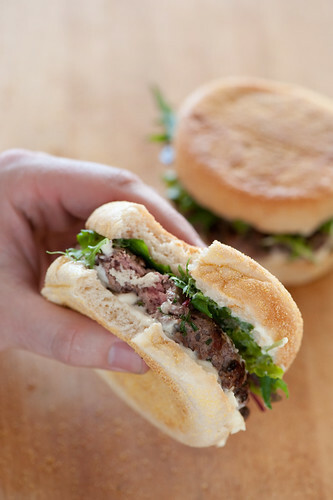 I must try this with homemade burger buns. Very interesting method of cooking on salt like this, I have never seen it before. I love a good burger. These looks so good, they’re making my stomach rummble! I’ll try this out soon, it sounds so simple. 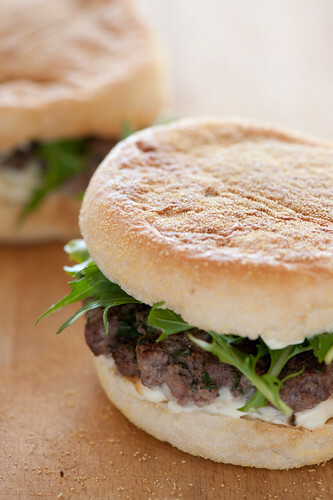 I also love the idea of having a burger in a muffin, never thought of making that before. I really like the wholemeal muffin that we get here too. These are delicious! I grew up in a cold climate and my mother would have “winter picnics” and would cook our burgers this way! They are second best only to the grill! I don’t have anything against ketchup but I completely agree: a burger with mayo is the absolute best. The Crazy Pink Hybrid Sauce is basically what we Idahoans call Fry Sauce, which is amazing with everything dippable. Thank you very much Steve! I just visited this site trying to find ideas for cooking burgers without a grill (which this recipe does sound appealing) and I came across him calling it the “Crazy Pink Hybrid Sauce”. All I could think of then was hoping that a fellow Idahoan had already seen it and mentioned fry sauce. Hear, hear! Another great tip. It works for thick steaks, too. Of course I second the motion for mayo — but in my not-so-humble opinion the best mayo in the world is the Japanese type sold in plastic squeeze bottles with red caps under the brand “Kewpie” (and occasionally called “yum-yum sauce”. Wow – that looks amazing – and such a clever idea. Will definitely put this in my “recipes to try” folder (which is growing more quickly than I can cook!). I’d have to add a 6th ingredient and add cornichons I confess – I love them! One of the best things about having kids has to be getting their pickles when we have burgers – memories like this mean you can cope with the witching hour when kids seem like less of a good idea and more punishment..
Michael Pollan is increadible and these burgers look great! Can’t wait to try. A chef I know told me about the salt tip a few years ago, and my burgers now taste soooo good! These sound delicious. I’m going to try these out this Sunday for sure. oh yes, you did those the right way. perfect between an english muffin. Great idea! I’ve been pan-frying burgers for years, with hit-or-miss results. Will give this a try… and look for that book you mentioned! Oh, and I first encountered it as Fry Sauce when I lived in Moscow, Idaho for college. Yum. And I just finished making them! Even done medium-well (I am pregnant and being careful), these are delicious — a shade saltier than I normally go, but soooo good. Bought the ground beef today for a test of this idea tomorrow. We’re eating our second batch tonight, with Branston pickle on top. Soooooo good. And I’ve been pimping this recipe to everyone I know. I tried a similiar idea with steak before. You salt the steaks excessively for an hour before cooking. Then you wash off all the salt, season and grill. Amazing. It makes it so tender! Love this idea too. I’m definitely bookmarking it. These were delicious… made them tonight. Quite a bit saltier than I expected, but I think I may be able to get by with doing slightly less than 1 tsp of salt the next time I do them. Otherwise, a fantastic way to cook good grass-fed beef. 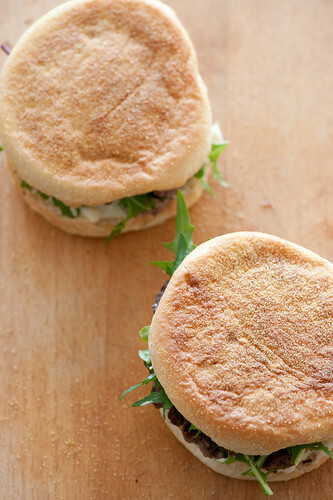 Admittedly, I like the idea now of an English muffin for a bun. I toasted mine first, and it was wonderful! Can you also do this with turkey burgers? pretty much any ground meat works. I made buffalo burgers a few weeks ago – delish! It was very good but I’d say less salt would be even tastier! Maybe like half of what it calls for :D! How does one go about making homemade mayonnaise? I used this method today in a cast iron skillet and it worked wonderfully. Best non-grilled burgers I’ve ever had! Thank you. :) And it was salty… but that’s the way we like things so no complaints from the husband and I. This will be the only way we make our burgers from now on! Thank you soooo very much for this recipe. Have been unsuccessfully cooking burgers on the stove for 20 years. This recipe really works for me. I can’t believe how the burger puffs up and yet the middle isn’t raw. Thanks again ever so much for taking the time to post this!! Tried this, definitely salty the first time but the best burgers ive ever made! !